Pollination, an important step in the reproduction of seed plants, is the transfer of pollen grains (male gametes) from the male reproductive organ to the female reproductive organ that contains the ovule (female gamete) or transfers it to the ovule itself. Plants, being immobile, normally require agents for the transport of pollen, which are commonly wind, insects, birds, mammals (bats, rodents, primates), and water. Seed-bearing plants are traditionally divided into angiosperms, or flowering plants, and gymnosperms. In gymnosperms (conifers, ginkgos, cycads, Gaetophyta), the seeds are not formed in an ovule that is enclosed, but naked on the scales of a cone or cone-like structure. Most gymnosperms rely on wind-pollination. The flowering plants cover their seeds by including them in a true fruit. They bear the reproductive organs in a structure called a flower; the ovule is enclosed within a carpel (female reproductive organ of a flower), which will lead to a fruit. Many angiosperms have unique adaptations to attract animals, such as honeybees or hummingbirds, to act as the agents of pollination. Pollination reflects an underlying harmony in nature. Animal pollinators advance their own survival, maintenance and reproduction by seeking sugar-rich nectar from plants for energy and/or pollen as a protein source. Plants advance their reproduction through providing items attractive to the animal pollinators. In most cases, both receive benefit and contribute to the other. Such examples of a mutualistic relationship also fits with the view of Lynn Margulis and Dorien Sagan (1986) that "Life did not take over the globe by combat, but by networking"—that is, by cooperation, as seen in the coevolution of bees and flowering plants. 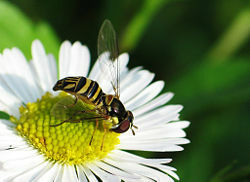 The study of pollination brings together many disciplines, such as botany, horticulture, entomology, and ecology. Pollination is important in horticulture because most plant fruits will not develop if the ovules are not fertilized. Honey bee in the act of pollination. About 80 percent of all plant pollination is biotic. Of the 20 percent of abiotically pollinated species, 98 percent is by wind and 2 percent by water and sun. The terms "pollinator" and "pollenizer" are often confused. A pollinator is the agent that moves the pollen, whether it be wind, bees, bats, moths, or birds. A pollenizer is the plant that provides the pollen. Pollination syndromes are groups of adaptations of flowers that attract particular types of pollinators. The receptive part of the female reproductive organ is called a stigma in the flowers of angiosperms and a micropyle in gymnosperms. Some plants are self-fertile or self-compatible and can pollinate themselves. Other plants have chemical or physical barriers to self-pollination and need to be cross-pollinated. These are self-infertile plants. Pollination can be cross-pollination with a pollinator and an external pollenizer, self-pollenization with a pollinator, or self-pollination without any pollinator. Cross-pollination. In cross-pollination (syngamy), pollen is delivered to a flower of a different plant. Plants adapted to outcross or cross-pollinize tend to have taller stamens than carpels to better spread pollen to other flowers. Self-pollination. In self-pollination, pollen moves to the female part of the same flower, or to another flower on the same individual plant, without the use of an external pollinator (such as the stamens actually growing into contact with the pistil to transfer the pollen). Self-pollenization. In self-pollenization (autogamy), pollen moves to the female part of the same flower, or to another flower on the same individual plant, with the use of a pollinator. This is sometimes referred to as self-pollination, but self-pollination is not synonymous with autogamy. Clarity requires that the term self-pollination be restricted to those plants that accomplish pollination without an external pollinator. Most peach varieties are autogamous, but not truly self-pollinated, as it is generally an insect pollinator that moves the pollen from anther to stigma. Plants adapted to self-fertilize have similar stamen and carpel length. Cleistogamy. Pollination that occurs before the flower opens is always self-pollination. Some cleistogamous flowers never open, in contrast to chasmogamous flowers that open and are then pollinated. Cleistogamous flowers must of necessity be self-compatible or self-fertile plants. Other plants are self-incompatible. These are end points on a continuum, not absolute points. Hybridization is effective pollination between flowers of different species of the same genus, or even between flowers of different genera (as in the case of several orchids). 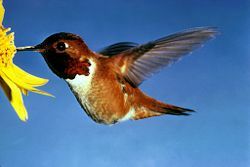 A Rufous Hummingbird (Selasphorus rufus) is attracted to brightly colored flowers and assists the pollination of the plant. Zoophily is a form of pollination whereby pollen is transferred by vertebrates, particularly by hummingbirds and other birds, and bats, but also by monkeys, marsupials, lemurs, bears, rabbits, deer, rodents, lizards and other animals. Zoomophilous species, like entomophilous species, frequently evolve mechanisms to make themselves more appealing to the particular type of pollinator, e.g. brightly colored or scented flowers, nectar, and appealing shapes and patterns. These plant animal relationships are often mutually beneficial because of the food source provided in exchange for pollination. There are different benefits and costs associated with any vector type, whether wind, water, insects, or vertebrates. For instance, using animal pollination is beneficial because the process is more directed and often results in pollination. At the same, time it is costly for the plant to produce rewards, such as nectar, to attract animal pollinators. Not producing such rewards is one benefit of using abiotic pollinators, but a cost associated with this approach is that the pollen may be distributed somewhat randomly. In general, pollination by vertebrates occurs when the animal reaches inside the flowers for nectar. While feeding on the nectar, the animal rubs or touches the stamens and is covered in pollen. Some of this pollen will be deposited on the stigma of the next flower it visits, pollinating the flower (Missouri Botanical Garden 2006). Most bat species that pollinate flowers inhabit Africa, Southeast Asia, and the Pacific Islands, although bat pollination occurs over a geographically wide range. Many fruits are dependent on bats for pollination, such as mangoes, bananas, and guavas (USDA 2006). Bat pollination is an integral process in tropical communities with 500 tropical plant species completely, or partially, dependent on bats for pollination (Heithaus 1974). Also, it has been noted that outcrossing (introducing unrelated genetic material into a breeding line) by bats increases genetic diversity and is important in tropical communities (Heithaus 1974). Plants pollinated by bats often have white or pale nocturnal flowers that are large and bell shaped. Many of these flowers have large amounts of nectar, and emit a smell that attracts bats, such as a strong fruity or musky odor (Gibson 2001). Bats use certain chemical cues to locate food sources. They are attracted to odors that contain esters, alcohols, aldehydes, and aliphatic acids (Gibson 2001). The banana bat (Musonycteris harrisoni) is a nectarivorous species found only on the Pacific coast of Mexico. It has a very small geographic range and is distinguishable by its extremely long nose. The long snout and tongue, one tongue recorded as measuring 76mm, allows this bat to feed on the nectar of long tubular flowers. This bat species is small, with the head and body length ranging from 70 to 79mm. The wild banana flower is elongated with a purple color (Tellez 1999). Non-flying mammals have been found to feed on the nectar of several species of plant. Though some of these mammals are pollinators, others do not carry or transfer enough pollen to be considered pollinators (Johnson 2001). The group of non-flying pollinators is mainly composed of marsupials, primates, and rodents (Johnson 2001). Well-documented studies of non-flying mammal pollination now involve at least 59 species of mammals distributed among 19 families and six orders (Carthewa 1997). As of 1997, there were 85 species of plants from 43 genera and 19 families that were visited by these mammals (Carthewa 1997). In many cases, a plant species is visited by a range of mammals. Two examples of multiple mammal pollination are the genus Quararibea which is visited by 12 species and Combretum which is visited by eight (Carthewa 1997). Plant species that feed non-flying mammals will often exhibit similar characteristics to aid in pollination. The flowers are often large and sturdy, or are grouped together as multi-flowered inflorescences. Many non-flying mammals are nocturnal and have an acute sense of smell, so the plants tend not to have bright showy colors, but instead excrete a pungent odor. Plants will often flower profusely and produce a large amount of sugar-rich nectar. These plants also tend to produce large amounts of pollen, because mammals are larger than some other pollinators, and lack the precision smaller pollinators can achieve (Carthewa 1997). Animals with more precision, such as bees or other insects with a proboscis, can pollinate small flowers with less pollen necessary. This means that a plant will require more pollen for a larger mammal pollinator. One example of a symbiotic relationship between a plant and its animal pollinators is the African Lily, Massonia depressa, and some rodent species of the Succulent Karoo region of South Africa. At least four rodent species, including two gerbil species, were found to be visiting M. depressa during the night (Johnson 2001). Traits of the M. depressa flowers support non-flying mammal pollination. It has dull-colored and very sturdy flowers at ground level, has a strong yeasty odor, and secretes copious amounts of sucrose-dominant nectar during the night (Johnson 2001). The nectar of M. depressa was also found to be 400 times as viscous, or resistant to flow, as an equivalent sugar solution. This jelly-like consistency of the nectar may discourage insect consumption while also facilitating lapping by rodents. It is assumed that M. depressa coevolved with its pollinators (Johnson 2001). The term ornithophily is used to describe pollination specifically by birds. Hummingbirds, found only in North and South America, are the most recognized nectar-eating bird, but there are many other bird species throughout the world that also are important pollinators. These include: sunbirds, honeyeaters, flowerpeckers, honeycreepers, and bananaquits (EEB 2006). Plants pollinated by birds often have brightly colored diurnal flowers that are red, yellow, or orange, but no odor because birds have a poor sense of smell. Other characteristics of these plants are that they typically have suitable, sturdy places for perching (though hummingbirds can hover) and abundant nectar that is deeply nested within the flower. Often flowers are elongated or tube shaped. Also, many plants have anthers placed in the flower so that pollen rubs against the birds head/back as the bird reaches in for nectar (USDA 2006). The ruby-throated hummingbird (Archilochus colubris) is one of many species of hummingbirds. Found in North and Central America, this bird is an important pollinator for a variety of plant species. Some species, such as the trumpet creeper, are adapted specifically for ruby-throated hummingbirds (Harris 2000). This species is quite small, measuring 7.5-9.0 cm long and weighing only 3.4-3.8 g. The long narrow bill of the hummingbird is the perfect tool for extracting nectar from elongated flowers (Harris 2000). This species is attracted to brightly colored flowers, especially those that are red in color (Harris 2000). Although lizard pollination has historically been underestimated, recent studies have shown lizard pollination to be an important part of many plant species' survival. Not only do lizards show mutualistic relationships, but these are found to occur most often on islands. This pattern of lizard pollination on islands is mainly due to their high densities, a surplus of floral food, and a relatively low predation risk when compared to lizards on the mainland (Olesen 2003). The lizard Hoplodactylus is only attracted by nectar on flowers, not pollen. This means flowers pollinated by this species must produce copious nectar as a reward for Hoplodactylus. Scented flowers are another important adaptation to attract lizards due to their acute sense of smell. Although lizards have the ability to distinguish colors, because Hoplodactylus and other lizards feed nocturnally, it is sometimes less important for flowers to allocate resources to showy inforescences. Flowers must also be robust enough to support the weight of the pollinator while feeding (Whitaker 1987). In New Zealand, Hoplodactylus geckos visit flowers of many native plant species for nectar and pollen. The flowers of Metrosideros excelsa are pollinated by more than 50 types of gecko as well as birds and bees. Of the geckos visiting this species, two-thirds of them carried large amounts of pollen, suggesting a main role in pollination. However, after the arrival of humans in New Zealand, lizard populations have declined, making it more difficult to witness lizard pollination (Olesen 2003). Entomophily is a form of pollination whereby pollen is distributed by insects, particularly bees, Lepidoptera (e.g., butterflies and moths), flies, and beetles. Entomophilous species frequently evolve mechanisms to make themselves more appealing to insects, such as brightly colored or scented flowers, sugar-laden nectar, and appealing shapes and patterns. Pollen grains of entomophilous plants are generally larger than the fine pollens of anemophilous (wind pollinated) plants. They usually are of more nutritional value to insects, who may use them for food and inadvertently spread them to other flowers. Entomophilous species include the sunflower, orchid, and cycad. Some pollinizers attract insects by means that do not provide direct benefit to the insect pollinator, such as nectar or pollen. For example, some orchids mimic the female of the species to draw in the male to attempt mating with the flower. 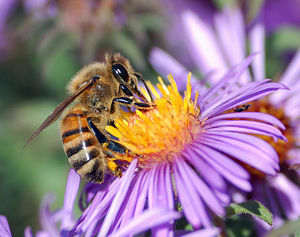 Honeybees (or honey bees) travel from flower to flower, collecting nectar (later converted to honey), and pollen grains. The bee collects the pollen by rubbing against the anthers. The pollen collects on the hind legs, in dense hairs referred to as a pollen basket. As the bee flies from flower to flower, some of the pollen grains are transferred onto the stigma of other flowers. Nectar provides the energy for bee nutrition; pollen provides the protein. When bees are rearing large quantities of brood (beekeepers say hives are "building"), bees will deliberately gather pollen to meet the nutritional needs of the brood. A honeybee that is deliberately gathering pollen is up to ten times more efficient as a pollinator than one that is primarily gathering nectar and only unintentionally transferring pollen. Good pollination management seeks to have bees in a "building" state during the bloom period of the crop, thus requiring them to gather pollen, and making them more efficient pollinators. Thus, the management techniques of a beekeeper providing pollination services are different from, and somewhat incompatible with, those of a beekeeper who is trying to produce honey. 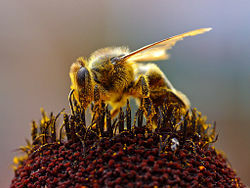 Other species of bees will differ in various details of their behavior and pollen-gathering habits, and it should be remembered that honeybees are not native to the Western Hemisphere; all pollination of native plants in the Americas has been historically performed by various native bees. Pollination management is a branch of agriculture that seeks to protect and enhance present pollinators and often involves the culture and addition of pollinators in monoculture situations, such as commercial fruit orchards. The largest managed pollination event in the world is in Californian almond orchards, where nearly half (about one million hives) of the U.S. honeybees are trucked to the almond orchards each spring. New York's apple crop requires about 30,000 hives; Maine's blueberry crop uses about 50,000 hives each year. Bees are also brought to commercial plantings of cucumbers, squash, melons, strawberries, and many other crops. Honeybees are not the only managed pollinators: other species of bees are also raised as pollinators. The alfalfa leafcutter bee is an important pollinator for alfalfa seed in western United States and Canada. Bumblebees are increasingly raised and used extensively for greenhouse tomatoes and other crops. Well pollinated blackberry blossom begins to develop fruit. Each incipient drupelet has its own stigma and good pollination requires the delivery of many grains of pollen to the flower so that all drupelets develop. The ecological and financial importance of natural pollination by insects to agricultural crops, improving their quality and quantity, has become more and more appreciated and has given rise to new financial opportunities. The vicinity of a forest or wild grasslands near agricultural crops, such as apples, almonds, or coffee can improve their yield by about 20 percent. This may result in forest owners demanding payment for their part in the improved results. This is a simple example of the economic value of ecological services. Losey and Vaughan (2006) report that native insect pollination saves the United States agricultural pollination management industry nearly an estimated $3.1 billion annually through natural crop production. Pollination also requires consideration of pollenizers (the plant that provides the pollen). In pollination management, a good pollenizer is a plant that provides compatible, viable and plentiful pollen and blooms at the same time as the plant that is to be pollinated. Peaches are considered self-fertile because a commercial crop can be produced without cross-pollination, though cross-pollination usually gives a better crop. Apples are considered self-incompatible, because a commercial crop must be cross-pollinated. Most fruits are grafted clones, genetically identical. An orchard block of apples of one variety is in effect all one plant. Growers now consider this a mistake. One means of correcting this mistake is to graft a limb of an appropriate pollenizer (generally a variety of crabapple) every six trees or so. Pollination of food crops has become an environmental issue, due to two trends. The trend to monoculture means that greater concentrations of pollinators (the agent of pollination) are needed at bloom time than ever before, yet the area is forage poor or even deadly to bees for the rest of the season. The other trend is the decline of pollinator populations, due to pesticide misuse and overuse, new diseases and parasites of bees, clearcut logging, decline of beekeeping, suburban development, removal of hedges and other habitat from farms, and public paranoia about bees. Widespread aerial spraying for mosquitoes due to West Nile fears is causing an acceleration of the loss of pollinators. The United States solution to the pollinator shortage, so far, has been for commercial beekeepers to become pollination contractors and to migrate. Just as the combine harvesters follow the wheat harvest from Texas to Manitoba, beekeepers follow the bloom from south to north, to provide pollination for many different crops. Carthewa, S. M., and R. L. Goldingay. 1997. Non-flying mammals as pollinators. Trends in Ecology & Evolution 12(3): 104-108. Dafni, A., P. G. Kevan, and B. C. Husband. 2005. Practical Pollination Biology. Enviroquest. ISBN 9780968012307. Ecology & Evolutionary Biology (EEB) Greenhouses. 2006. University of Conneticut EBB Plant Growth Facilities. Retrieved December 1, 2006. Gibson, A. 2001. Bats and their flowers. Mildred E. Mathias Botanical Garden. 4(4). Retrieved May 28, 2007. Harris, M., R. Naumann, and K. Kirschbaum. 2000. Archilochus colubris. Animal Diversity Web. Retrived November 7, 2006. Heithaus, R., P. A. Opler, and H. G. Baker. 1974. Bat activity and pollination of Bauhinia Pauletia: Plant-pollinator coevolution. Ecology 55(2): 412-419. Retrieved May 27, 2007. Losey, J. E., and M. Vaughan. 2006. The economic value of ecological services provided by insects. BioScience 56(4): 311-323. Missouri Botanical Garden. 2006. Biology of plants: Pollination. Missouri Botanical Garden. Retrieved November 7, 2006. Olesen, J. M., and A. Valido. 2003. Lizards as pollinators and seed dispersers: An island phenomenon. Trends in Ecology and Evolution 18(4): 177-181. Tellez, G., and J. Ortega. 1999. Mammalian species: Musonycteris harrisoni. American Society of Mammalogists 622: 1-3. Retrieved November 7, 2006. USDA Forest Service, Rangeland Management Botany Program. 2006. Celebrating Wildflowers: Bat pollination. USDA Forest Service. Retrieved November 7, 2006. Whitaker, A. H. 1987. The roles of lizards in New Zealand plant reproductive strategies. New Zealand Journal of Botany 25: 315-328. All links retrieved May 11, 2015. This page was last modified on 11 October 2015, at 16:14.